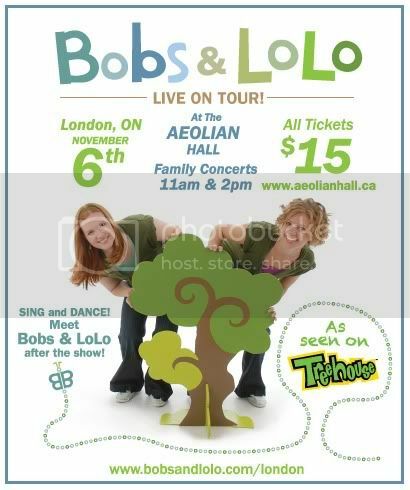 Here's your chance to win tickets to see Bobs and Lolo with your little ones this weekend! Not only will you win 4 tickets to see the concert but you will also be invited to a special meet and greet on Friday afternoon at Once upon a teacup where you can take a photo and get autographs! Please send an email to contests@londonmoms.ca with your username, real name and phone number for your chance to win. Please include Bobs and Lolo in the subject line! All entries recieved by November 3, 2010 at 8PM will be eligible for this fantastic prize package! Last edited by Leslie; 11-01-2010 at 10:05 AM. I sent! Hope that my little orangehead will win! Contest closes tonight at 8pm so be sure to get your entries in ladies! OPPS OBVIOUSLY CAPS WENT ON! Congrats to Becky Newell the winner of our contest!! Don't forget that you can still order tickets yourselves and join us for the meet and greet on Friday! Tickets are only $15 each! Oh wow this is awsome!! HOw do i claim my tickets, i am in woodstock? I believe you can pick them up at the meet and greet on Friday! Congrats!